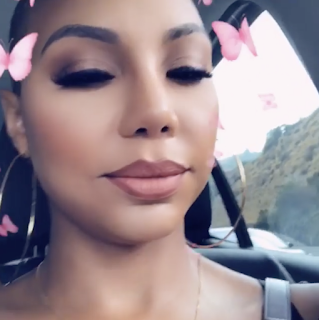 Last October Tamar Braxton filed for divorce from her husband / manager Vincent Herbert one month shy of their 9th anniversary [click here if you missed that]. According to reports Tamar has been warned by the L.A. County court that her divorce is at risk of being dismissed for inactivity. Vincent has not responded to the filing and the court is asking Tamar to prove he was served if she wants a default judgement. Tamar is also seeking primary custody of their 4-year-old son Logan. Playing games with the court system is never a good look. No. It is not. The court system is collateral damage! Everything is for shock value. I am now numb, its very tired. I never liked this finger shaking, bottom lip swinging bytch. She was annoying as hell and mad disrespectful to her sisters. Now she's talking about "She didn't get it at first". Get what? You didn't learn how to be polite to your family until you turned 50? I'm now skeptical about this whole divorce story. Vince hasn't responded to a request for divorce that includes a request for a decision as to his kid's placement following the divorce? He likely wan't served and can prove it and is not answering or this whole thing is a farce. The courts don't play with divorce. Bf the judge signed my divorce decree, he made me and my ex husband audibly affirm several times that we wanted the divorce to be final and told us there was no going back after he signed the decree. Thank you, Jesus, for that release! This seems odd because Ben Affleck and Jen Garner divorce just got finalized. The judge warned them too, but they filed like 2 years ago. Why is the judge doing this to them and it's not even been a year? Could it be that Ben & Jen are the white - I mean right color??? @prissa o - It depends on where you file. Not sure if they filed in the same state. Also, the person who filed is required to prove proper service within a certain amount of time for the divorce to proceed - sounds like Tamar can't or didn't do that. If they can't prove proper service, the filing gets tossed. I'm going to assume that irrespective of race, Jen and Ben likely had more responsive lawyers who kept them to a timeline for the divorce. Courts don't allow cases to just sit without movement for any meaningful length of time. Divorces get dragged out because the couple is dragging their feet on something.